How’s that for some awesome alliteration? Hey there! I’m Missy from Missy Dear and I’m so excited to be the craft contributor here at I’m Topsy Turvy! I’ve long admired Ashlee and I’ve had such fun getting to know the other ladies a little over the last week or so. We’ve been having some crazy weather here in North Carolina the past few weeks. It’s resulted in 8 snow days since January 1st which means there’s a lot of time that I need to fill with projects for my daughter and niece. They love to dress up and get “all fancy” so I decided that maybe an easy jewelry project was in order. And this simple Braided & Beaded Bracelet was just the thing. This project was perfect for my 11 year old niece, but 5 year old Abi had a much better time watching. It’s pretty simple as long as you can do a little basic braiding. 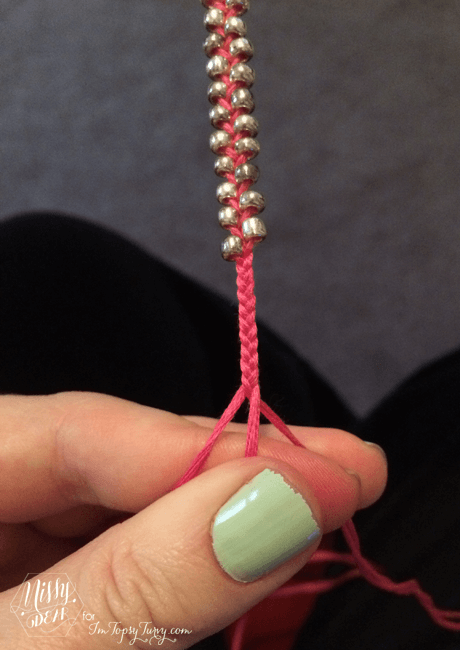 Bracelet Findings – I used the circle and post kind. Thread – I used embroidery floss since I had it on hand, but I would suggest something sturdier, like waxed thread. It would make the beading much easier. Beads – I used some silver glass seed beads. First let me apologize for the pictures if they’re not very clear on what I’m doing. One thing I realized while doing this project is that trying to take pictures of a project that really works best while using two hands can be a little tricky. I’m not sure why I didn’t think to just take pictures of my niece doing it. I blame in on my prego brain. 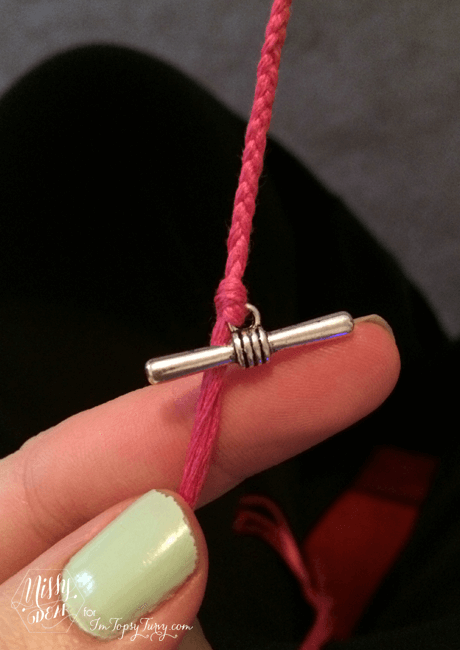 1 – Thread whatever you decided to use as the string onto the finding. I found that instead of tying it on, threading it through and doubling it over was the better option. 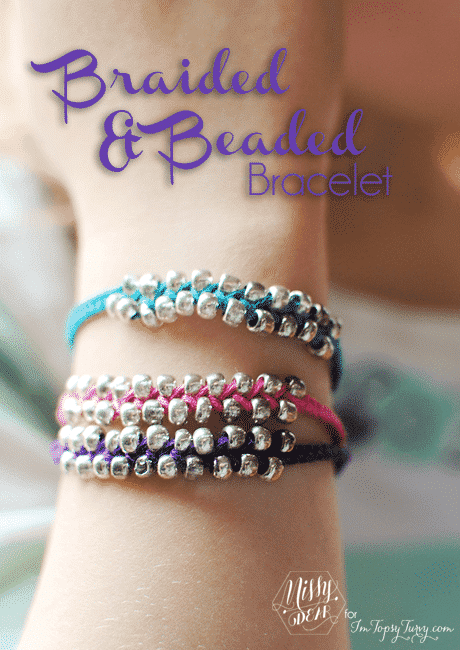 That way you don’t have a bulky knot, and it makes the bracelet a little thicker. And here’s a tip: taping it to the table top helps A TON! Braid about a third of the finished length of the bracelet. In my case I was making a 6 inch bracelet for Abi. So, this first braided section was 2 inches long. 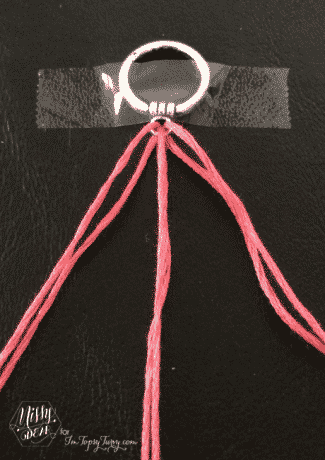 2 – Once you’ve reached the desired length add a bead to the outside thread that will next be going to the middle. When you cross it over to the middle, make sure that the thread coming over to take it’s place stays under the bead to hold it up. If it slips to the top of the bead then the braid will just get longer and the bead will get pushed down the bracelet. Does that make sense? 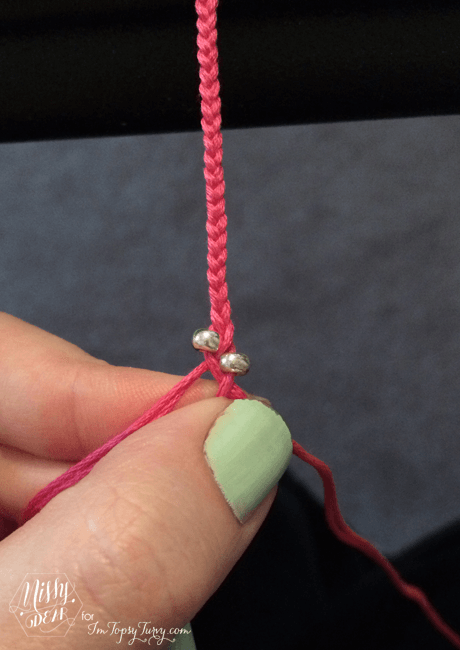 3 – Just keep braiding like normal, only adding a bead to the outside threads after every cross over. In this picture you can see a little more clearly what I mean by keeping the middle thread under the bead when you cross it over. Another tip: Try to keep your finger behind the beads at all times. I moved them for the sake of the pictures but it will save you so much frustration if you always have the beads held. If you don’t the bracelet starts to spin and the beads start kind of moving around. No bueno. 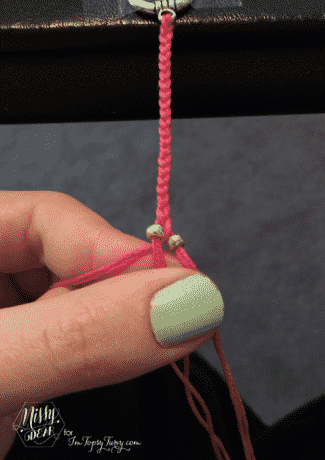 4 – Continue the beaded braid until you’ve done another third of the length (in my case, another 2 inches). Once you reach that length just finish out the bracelet with a normal braid like in the beginning. 5 – Then just tie it onto the post. To keep it a little more secure from coming undone I dabbed a little bit of hot glue around the knot. I’ve never done that before but it sounded like a good idea so I thought I’d give it a try. I’ll let you know how it works out. And there you have it! 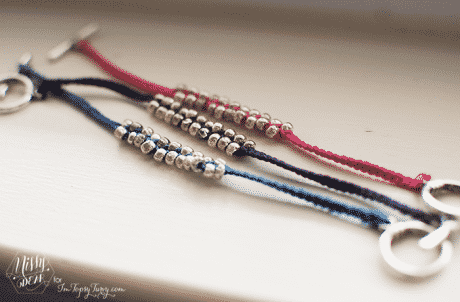 Have you ever tried your hand at a fun DIY jewelry project? How did it turn out? Follow along on my blog or social media and make sure you tag me if you make yourself one of these great bracelets! I’d love to see it!! Full Time Mom + Free Time Blogger + Handmade Maker.Missy has been blogging since 2009; first as the creator and host of So You Think You're Crafty, the first "reality" blog, before leaving in 2013 to spend more time with her family and her new blogging adventure, Missy Dear. She also runs a handmade shop selling 100% wool felt hair accessories and loves it. Missy loves to do anything creative using almost any medium from food to paper to fabric to digital. So cute and such an easy project! Thanks for sharing!! Wow, these are so cute! And I love how you the possibilities are endless. Thanks for sharing!